Niger’s army killed more than 280 Boko Haram militants near the southeast border with Nigeria in days of land and air raids, the defence ministry said Wednesday. More than 200 jihadists were killed in air strikes and a further 87 by ground troops since the offensive began on December 28, the ministry said in a statement read on state television. It comes after Western African leaders held talks in November on the escalating attacks by the Nigerian Islamist group in the Lake Chad area, a strategic region where the borders of Chad, Cameroon, Nigeria and Niger converge. A photo shows a campaign signboad displayed by the ruling All Progressives Congress (APC) to show its readiness to defeat Boko Haram Islamists on assumption office at Ogijo, Ogun State in southwest Nigeria, on July 3, 2015. Boko Haram carried out a fresh wave of massacres in northeastern Nigeria on July 3, locals said, killing nearly 200 people in 48 hours of violence President Muhammadu Buhari blasted as “inhuman and barbaric”. AFP PHOTO The operations were carried out on the islands of Lake Chad and along the Komadougou Yobe river which serves as a natural border between Niger and Nigeria, which has suffered a string of recent attacks on its military bases. The Niger army said it had lost no troops or equipment in its offensive and had seized eight canoes and two rocket launchers as well as assault weapons, ammunition and vehicles. In December, Niger’s defence minister said he feared Boko Haram would launch renewed attacks on its positions from January, when the Komadougou Yobe river’s waters which usually prevent incursions begin to recede. Niamey was particularly concerned by the situation in Nigeria where “military bases have been defeated,” Defence Minister Kalla Moutari said in parliament. “Boko Haram fighters were able to get supplies, they were able to reinvigorate themselves,” said Moutari. Boko Haram’s bloody insurgency began in northeastern Nigeria in 2009 but has since spread into neighbouring countries, prompting a regional military response. Some 27,000 people have been killed and two million others displaced, sparking a dire humanitarian crisis in the region. Militants have targeted both soldiers and civilians and have been blamed for abductions of children and employees of foreign companies. In November, around a dozen girls were taken in raids on several border villages in southeastern Niger. In the same month, seven local employees of a French drilling firm and a government official were killed after suspected Boko Haram gunmen stormed their compound. That attack shattered months of relative calm in the Diffa region near the Lake Chad basin. • The 116th Congress, with the House in Democratic control, has come to order. • The House approved legislation to reopen the government. 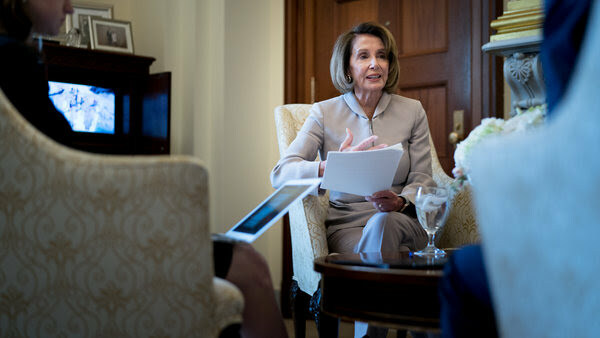 • Representative Nancy Pelosi, Democrat of California, was elected speaker. • The House has begun changing its rules to reflect the Democrats’ new priorities. House votes to reopen government. Measures pressure Senate. The House, with its new Democratic majority, passed two bills on Thursday night to reopen the government — one major spending bill to fund most shuttered departments and agencies through Sept. 30 and a stop-gap measure to restart the Department of Homeland Security for a few weeks — without funding for a border wall. The measures are likely to go nowhere for now, but they will raise pressure on Republicans to come to the negotiating table. Senators Cory Gardner of Colorado and Susan Collins of Maine, two of the most endangered Republicans up for re-election in 2020, said they want a vote. But the White House formally notified Congress of the president’s intent to veto the legislation, and Senator Mitch McConnell, the majority leader, has said he will not put them to a vote without Mr. Trump’s support. The bills both have bipartisan stamps on them. The measure that would fund most of the government was assembled from six spending bills that passed the Senate Appropriations Committee with broad support. It passed easily, 241-190, with seven Republicans voting yes. The stopgap measure, which passed 239-192 with a handful of Republicans crossing party lines, is similar to one that passed the Senate in December without dissent. House changes its rules to reflect Democratic priorities. The House on Thursday night approved the first part of a package of rules changes designed to improve order in the House chamber, ease introduction of bipartisan legislation and recognize the growing diversity among lawmakers. The other two parts are expected to be considered Friday and next week. The measure faced some opposition from the House’s most liberal members, particularly Representatives Ro Khanna of California and Alexandria Ocasio-Cortez of New York, who objected to the inclusion of so-called pay-as-you-go provision, which requires all new spending to be offset by equal cuts or tax increases. Representative Tim Ryan, Democrat of Ohio and a prominent critic of Ms. Pelosi, argued that Republicans had not abided by such strictures of fiscal discipline, so Democrats shouldn’t impose a straitjacket on their ambitions. In the end, Mr. Ryan voted yes. But the inclusion of other provisions, including a rule that would force House lawmakers to be financially liable for discrimination settlements as well as sexual harassment settlements, made it difficult to vote no. The rules changes will also make it easier to raise the government’s statutory borrowing limit by making a boost to the debt ceiling automatic with the passage of an annual budget. The package includes of priorities for Democratic lawmakers and members of the bipartisan Problem Solvers Caucus that helped Ms. Pelosi secure the votes for speaker. It gives lawmakers 72 hours to read any bill before a vote. And it creates a select committee on climate change, a priority for several newly elected representatives. The package also changes traditional rules of decorum on the House floor to allow for religious head gear, a nod to Representative Ilhan Omar of Minnesota, the newly elected Democratic representative who wears a head scarf. 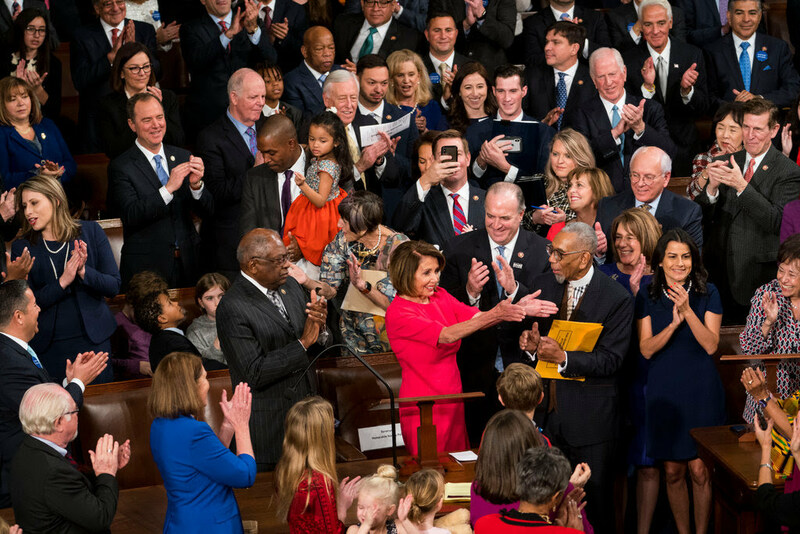 Right on schedule, the House gaveled in for the 116th Congress, with Democrats now in control. 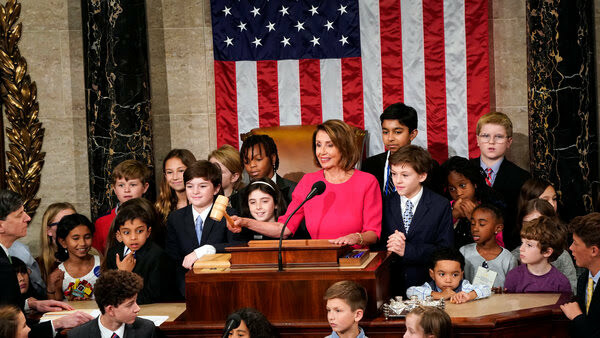 The name plate wasn’t on the door of the Capitol’s sumptuous speaker’s suite yet, but Ms. Pelosi strode out of the speaker’s office toward the chamber, grandchildren in tow. 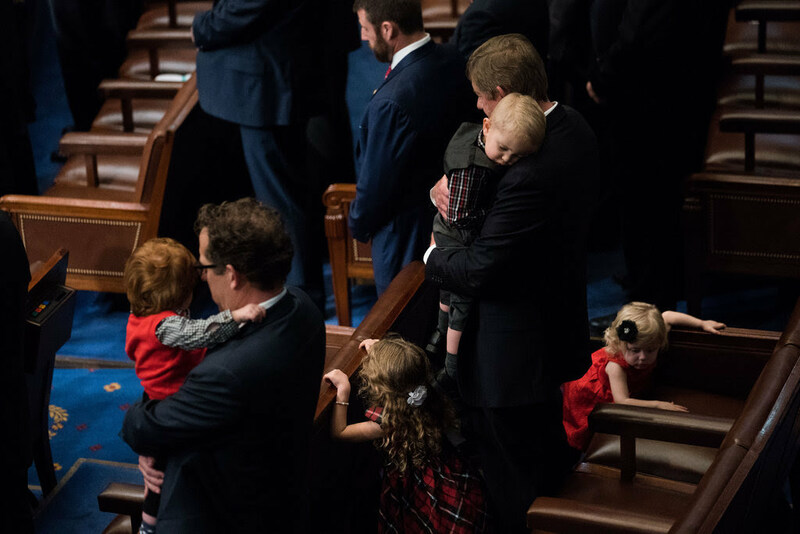 Lawmakers and their children and grandchildren waved from the well of the House to family members seated in the galleries above. The press section was packed standing-room-only with journalists, and visitors clogged the hallways waiting their turn to go through full-body security scanners and take seats in the balcony overlooking the floor. Tony Bennett, who sang “I left my heart in San Francisco” at a dinner honoring Ms. Pelosi at the Italian embassy Wednesday night, was spotted in the visitors gallery, as was Mickey Hart, former drummer of the Grateful Dead. Representative Hakeem Jeffries of New York, chairman of the House Democratic Caucus, nominated Ms. Pelosi to be speaker, prompting a standing ovation from most of the Democratic side of the House and much of the spectators in the gallery. While some Republicans clapped, few if any stood during the multiple ovations during his glowing introduction of Ms. Pelosi. “House Democrats are down with N.D.P.,” Mr. Jeffries said, using Ms. Pelosi’s initials. Representative Liz Cheney of Wyoming, chairwoman of the House Republican Conference, received a standing ovation from her colleagues when she nominated Representative Kevin McCarthy to be speaker. Ms. Cheney referenced Mr. McCarthy’s efforts in working to secure border-wall funding — “yes, Madam Clerk, build the wall” — in a nod to the ongoing government shutdown, which is at an impasse over the demand to fund the wall at the southwestern border. While Republicans stood, no Democrats acknowledged the remark. Just before 1 p.m., the House began its roll-call vote to elect a new speaker, with each member calling out the name of his or her preferred candidate. Most Democrats were voting for Ms. Pelosi, while most Republicans voted for Mr. McCarthy, but there were defectors on each side. Representative Ben McAdams of Utah voted for Representative Stephanie Murphy of Florida. Representative Conor Lamb of Pennsylvania voted for Representative Joseph P. Kennedy III. Representative Kathleen Rice of New York, one of the leading anti-Pelosi rebels, voted for Stacey Abrams, the failed Democratic candidate for governor in Georgia. Three freshmen with national security backgrounds, Mikie Sherrill of New Jersey, Elissa Slotkin of Michigan and Abigail Spanberger of Virginia, voted against her as well. Representative Jeff Van Drew of New Jersey simply voted present. Republicans had their own defectors. Representative Justin Amash voted for Representative Tom Massie of Kentucky. Technically, photos and videos are prohibited on the floor of the house chamber. But that didn’t stop a number of members from documenting the historic vote. Representative Ilhan Omar, Democrat of Minnesota, posted a video on Twitter of her vote. 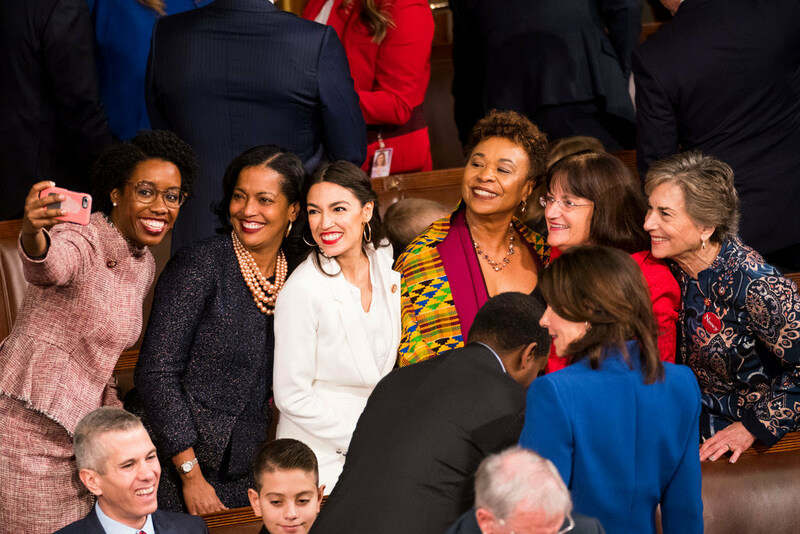 And Veronica Escobar, Democrat of Texas, could be seen taking a selfie with Ms. Pelosi and a handful of other women members on the Democratic side of the chamber. Ms. Pelosi suffered more than a dozen defections, mainly from freshmen who won their Republican districts in part by pledging to oppose her as speaker. Freshmen who did not vote for Ms. Pelosi: Anthony Brindisi of New York, Jason Crow of Colorado, Joe Cunningham of South Carolina, Ben McAdams of Utah, Max Rose of New York, Mikie Sherrill of New Jersey, Elissa Slotkin of Michigan, Abigail Spanberger of Virginia, Jeff Van Drew of New Jersey and Jared Golden of Maine. Defector serving his first full term: Conor Lamb of Pennsylvania. Opponents with more experience in the House: Jim Cooper of Tennessee, Ron Kind of Wisconsin, Kurt Schrader of Oregon and Kathleen Rice of New York. The final tally: Ms. Pelosi — 220; Mr. McCarthy — 192; Representative Jim Jordan, Republican of Ohio — 5, Representative Cheri Bustos, Democrat of Illinois — 4; Senator Tammy Duckworth, Democrat of Illinois — 2; Stacey Abrams of Georgia — 1; Joseph R. Biden Jr. — 1; Representative Marcia Fudge, Democrat of Ohio — 1; Representative Joseph p. Kennedy III, Democrat of Massachusetts — 1; Representative John Lewis, Democrat of Georgia — 1; Representative Thomas Massie, Republican of Kentucky — 1; Representative Stephanie Murphy, Democrat of Florida — 1; Present — 3. And the G.O.P. keeps its political foil. Republicans and their well-financed political arms have for years campaigned against Ms. Pelosi as an out-of-touch, elitist San Francisco liberal, tying every sort of Democratic candidate to her. In 2018, it didn’t work. Republicans appear determined to keep Ms. Pelosi’s speakership — and the Democratic House — limited to two years. The new Senate is also being sworn in — still in G.O.P. control. 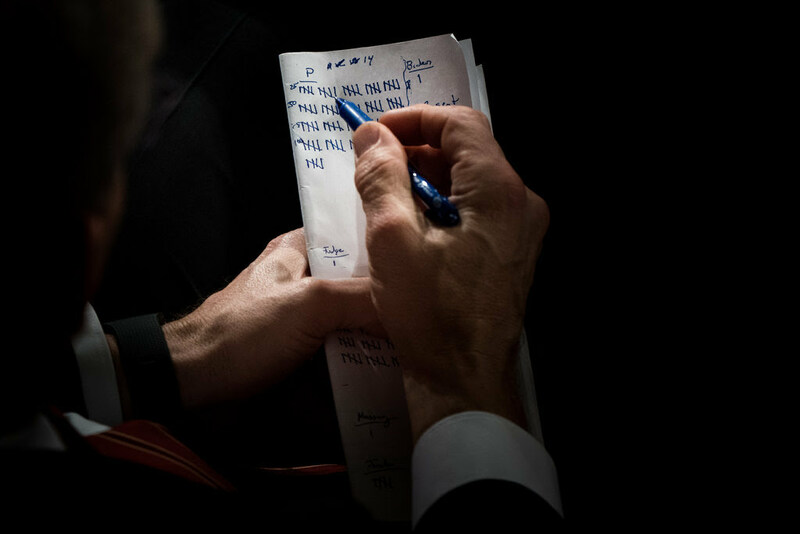 On the other side of the Capitol, the scene was more subdued as Vice President Mike Pence administered the oath of office to more than 30 new senators, who raised their right hands and signed their names one by one into the public record. “Do you solemnly swear to support and defend the Constitution of the United States against all enemies, foreign and domestic; that you will bear true faith and allegiance to the same; that you take this obligation freely, without any mental reservation or purpose of evasion; and that you will well and faithfully discharge the duties of the office on which you are about to enter, so help you God?” Mr. Pence asked each senator. In total, the new class gives Republicans a slightly more durable majority, 53 to 47, in the upper chamber. In an interview, Pelosi also raises impeachment. Even before she was elected speaker, Ms. Pelosi on Thursday morning started a historic day with a left hook, suggesting that a sitting president could be indicted. She made the comments in an interview with the “Today” show on NBC, when the host, Savannah Guthrie, asked if she agreed that the Justice Department guidelines against indicting a sitting president should be honored by the special counsel, who is investigating whether President Trump’s campaign colluded with Russians seeking to put him in the White House. For good measure, she warned her left flank that the House would not move quickly to impeach Mr. Trump, but she did not take impeachment off the table. Trump keeps up his attacks. But with House action coming, Mr. Trump is keeping up blame game. A new Congress, a whole new look. Swearing-in day is a time for lawmakers to make statements about themselves. Rashida Tlaib, Democrat of Michigan, Ms. Omar, and Deb Haaland, Democrat of New Mexico, did so with their attire. Ms. Tlaib, a Palestinian-American and one of the first two Muslim women elected to Congress (the other is Ms. Omar), wore her mother’s thobe — a traditional Palestinian dress — on the House floor. Her decision attracted attention on Twitter, with a hashtag #TweetYourThobe, encouraging Palestinian women around the country to tweet photos of themselves wearing thobes. Ms. Omar, a Somali refugee who wears a hijab, or head covering, became the first person to do so on the House floor. She has worked with Democratic leadership to carve out a religious exemption to a 181-year old rule barring hats of any type — a move that has drawn criticism from an evangelical pastor who complained she would make the House floor “look like an Islamic Republic.” The Orthodox Union, an umbrella group representing Orthodox Jews, supports the move. Ms. Haaland, who is one of two of the first Native American women to join the House, wore traditional Pueblo dress — including silver and turquoise jewelry and moccasins. Incoming speaker hails a “transformative” freshman class. In a diverse House, the first quadriplegic member will preside on Day 1. Representative Jim Langevin of Rhode Island, a veteran Democrat and the first quadriplegic elected to Congress, will have the honor of presiding over the first session of the 116th Congress — and the opening debate over how to reopen the government. In a new House that includes the first two Muslim women, the first two Native American women and a slew of other diversity firsts, Ms. Pelosi turned to the 54-year-old New Englander, who has been in the House since 2001. Niger’s army killed more than 280 Boko Haram militants near the southeast border with Nigeria in days of land and air raids, the defence ministry said Wednesday. More than 200 jihadists were killed in air strikes and a further 87 by ground troops since the offensive began on December 28, the ministry said in a statement read on state television. It comes after Western African leaders held talks in November on the escalating attacks by the Nigerian Islamist group in the Lake Chad area, a strategic region where the borders of Chad, Cameroon, Nigeria and Niger converge. The operations were carried out on the islands of Lake Chad and along the Komadougou Yobe river which serves as a natural border between Niger and Nigeria, which has suffered a string of recent attacks on its military bases. The Niger army said it had lost no troops or equipment in its offensive and had seized eight canoes and two rocket launchers as well as assault weapons, ammunition and vehicles. In December, Niger’s defence minister said he feared Boko Haram would launch renewed attacks on its positions from January, when the Komadougou Yobe river’s waters which usually prevent incursions begin to recede. Niamey was particularly concerned by the situation in Nigeria where “military bases have been defeated,” Defence Minister Kalla Moutari said in parliament. “Boko Haram fighters were able to get supplies, they were able to reinvigorate themselves,” said Moutari. Boko Haram’s bloody insurgency began in northeastern Nigeria in 2009 but has since spread into neighbouring countries, prompting a regional military response. Some 27,000 people have been killed and two million others displaced, sparking a dire humanitarian crisis in the region. Militants have targeted both soldiers and civilians and have been blamed for abductions of children and employees of foreign companies. In November, around a dozen girls were taken in raids on several border villages in southeastern Niger. In the same month, seven local employees of a French drilling firm and a government official were killed after suspected Boko Haram gunmen stormed their compound. That attack shattered months of relative calm in the Diffa region near the Lake Chad basin.